Town centre pub on Camberwell Church Street in Camberwell. It has seven hand pumps with Old Rosie scrumpy and several Weston's ciders, London Pride, Gravesend Shrimpers Bitter and, on visits in July 2009 and August 2010, a couple of Brodie's ales. Cider is clearly a focus of this pub, and four of the handpulls are seemingly dedicated to it, with a number of draught ciders as well, and at least one perry. In addition, they have Leffe, Hoegaarden, Amstel and others on draught. 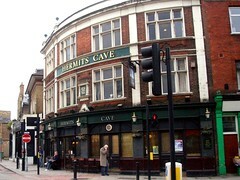 In September 2008, secretlondon's pint of Gravesend Shrimpers (£3/pint) was poor and flat, but the ales and ciders we've tried here since then have been fine. On secretlondon's visit in September 2008, the pub was laid out internally for football, with sofas set out cinema-style; there was an England match on later but they were showing a different game. When DrHyde visited in July 2009 there was no football on. The pub was busy but not packed, service was quick, the beer was good, and it felt friendly and welcoming. Ewan's August 2010 visit was during the day so the pub was very quiet indeed, but pleasant nonetheless. On another visit by Kake, Laura, Sarah et al. in September 2010, there was football on the TV but the seating arrangements were as normal, and it wasn't too intrusive. Accessibility: No steps to enter. It's step-free through to the toilets, but the ladies' at least is tiny, with a single small cubicle and a handwashing area narrow enough that if you want to let someone past to get into the cubicle you have to back out into the pub. Last edited 2016-06-21 10:56:50 (version 23; diff). List all versions. Page last edited 2016-06-21 10:56:50 (version 23).